Tuesday, 19 July 2016 By Marchetto Pellami S.p.A.
We spoke about vintage last in 2013 – quite a long time ago – but vintage leather after three years is still very much in vogue. Any doubts about it can be dispelled considering the abundance of couches, armchairs, and chair seats with vintage finishing, which have been seen in the last international leather and furniture exhibitions. 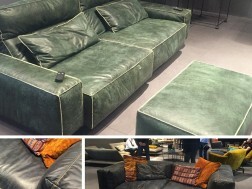 However, unlike how it was in 2013, we do not talk about the use of vintage leather in classic interior design and chesterfield sofas today, but instead in modern interior design, characterised by its neat and clean lines that enhance this leather carefully manufactured to have a worn-out finish. The match between the colours of the finishing and of the bottom are carefully studied to obtain a natural effect, emphasising singles parts and scratches, as if they have been used for a long time. And the result is quite surprising. Here below are some of the realisations displayed last February during Lineapelle, which highlight vintage leather in the Veronese green and classic black shades.